This article is 3109 days old. This Saturday morning Engineers without Borders, U of W Catholic Campus Ministry and War Child are partnering together to help rebuild the lives of Ugandan child refugees, many of whom had been kidnapped and forced into becoming child soldiers, with a Gula Walk. The Gula Walk was started in 2005, when founders Adrian Bradbury and Kieran Hayward heard about the night commuters in Gulu, northern Uganda. During the 22-year civil war, 40,000 children walked from their homes every night to sleep on Gulu’s streets in order to avoid being abducted and used as child soldiers by a rebel force called the Lord’s Resistance Army. Adrian and Kieran in July of 2005 walked 12.5 km from their homes to downtown Toronto to sleep on the steps of City Hall, and when they woke up at sunrise, they walked home and went to work. In total they walked 775 km in 154 hours and 18 minutes, taking 872,739 steps. As the weeks went on in July they were joined by hundreds of supporters, and their efforts have led to Gula Walk Day. Today, Gulu Walk is an international movement with more than 30,000 walkers in over 100 cities in 16 countries and has raised more than $1.5 million for projects benefitting northern Uganda’s war affected youth. 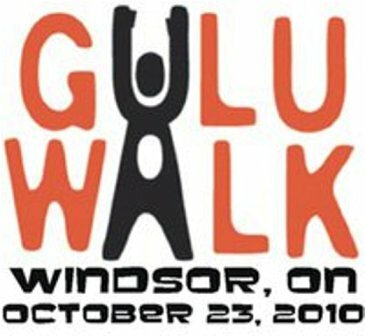 The Gula Walk starts at 10:30 am in front of the CAW Student Center on the campus of the University of Windsor. Participants will then walk downtown to Windsor City Hall and back (4 miles). Each participant is asked to donate at least $10. It is open to all adults and it is open to all who want to walk. For more information on how to become a Guluwalker in Windsor, email [email protected] or call 519-988-5918.